We may all know the Turing Test for artificial intelligence (can you tell it's a computer or a human? ), but this is not the imitation game of this particular movie. Rather, it is the work in intelligence and code-breaking that should have made Turing famous, at least once the war was won. Using flashbacks to illuminate the precocious, bullied and lonely schoolboy Turing (Alex Lawther) through his unrequited childhood crush on a school-friend, The Imitation Game colours the shy, brittle adult mathematician. 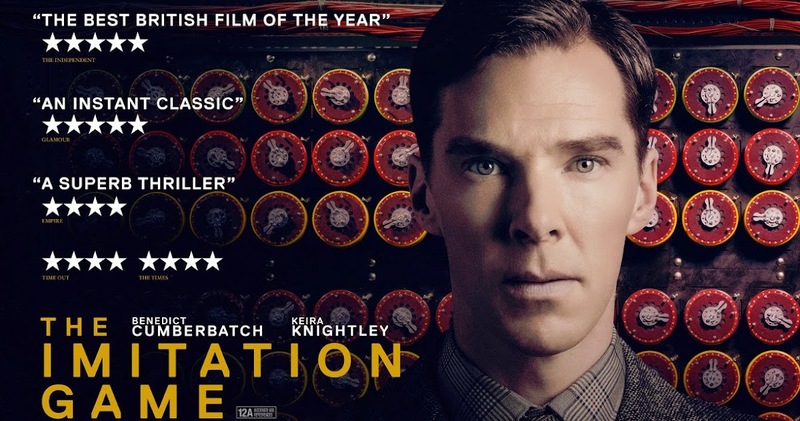 Of course the movie has to tell the Origins Story of the Bletchley code breakers, almost as an Oceans' Eleven, Avengers adventure, cranking up the drama with a pacey script and crackling dialogue by Graham Moore that sometimes tips over into period pastiche and a hint of melodrama. Director Morten Tyldum tries to keep their feet on the ground balancing the drama with period colour and decidedly not blinding us with the science. With Turing desperate to keep his homosexuality hidden, this is a world of wartime secrets with military intelligence men Mark Strong (Tinker Tailor, The Eagle) and Charles Dance (Dracula Untold) respectively for and against Turing's unconventional methods in breaking the 'unbreakable' enigma code. Turing has to assemble a team of top brains for the op, ultimately building the first re-programmable electronic computer - although hubris plays a part with the Germans themselves dropping a honking great clue to breaking the code. Kiera Knightley (A Dangerous Method, Anna Karenina) turns in a mature, understated performance as the ambitious middle-class girl with a head for mathematics. As the woman Turing almost married, Knightley turns a thinly written British posh girl into a brilliant career woman of unfulfilled potential. Somewhat unnecessarily, Rory Kinnear's police detective steps in from left field, convinced he has unearthed another Cambridge spy to add to Burgess, Philby and McClean, just to explain the prejudice in 50's society against homosexuality (still illegal in Britain at that time). Of course, we know they broke the code, but what the film brings home is the terrible responsibility of keeping it secret; of the lives that had to be sacrificed in order for the Allies to ultimately win the war, and which weighed on the emotionally fragile Turing along with his other secrets. Even with the solid cast around him, The Imitation Game rests on the slim shoulders of Cumberbatch to produce a version of Turing that is rude, eccentric, obsessive, driven, loyal and visionary. It doesn't matter that he looks or sound nothing like the man, this is fictionalised drama, not documentary and, despite a slightly coy script - the US market not all that keen on gay heroes, Behind the Candelabra notwithstanding - has our sympathies with Turing from the beginning.